Edward Denis De Vitre was a philanthropist with incredible community spirit. In 1840 he was Chairman of the Lancaster Gas Company. However, he is most famous as a doctor who in 1842 was a consulting physician at Lancaster Asylum and was a great proponent for the cause of the mentally afflicted. He became one of the founders of Royal Albert Asylum for Idiots and Imbeciles of the Northern Counties. He was elected Mayor in 1843 and again in1855. In 1845 he was also active in the committee of the Lancaster Canal, and by 1853 he was Director of West Hartlepool Harbour and Railway Company. He was a Justice of the Peace for the Borough and County of Lancaster, and in 1864 he was elected President of the Lancashire and Cheshire Branch of the British Medical Association. It is not difficult to imagine why a large procession accompanied his coffin to the Lancaster Cemetery in 1878. It was relocated some time before 1903 per photographic evidence and installed in Queen’s Square near King Street until 1942 when it was permanently removed. An obstacle to motor traffic is the most likely reason for its removal, in addition to public awareness of water sanitation. The fountain was design number 194 registered to George Smith & Co. manufactured by the Sun Foundry of Glasgow. The original structure was 17 feet 2 inches high. The pedestal with chamfered edge hosted four panels containing a lion mascaron with self-closing tap from which water spouted into demi-lune basins. Drinking water was captured in metal cups suspended on chains. Overflow water drained into small troughs at ground level for dogs. A frieze of acanthus leaves was situated beneath the capital upon which there was a lamp standard with a base of four decorative scrolls. The pedestal had a bulbous base with bas-relief extending into a fluted column with bands. A two tiered acroter supported decorative yoke maintenance arms and a tapered hexagon glass lantern. Compass cross, a cross of equal vertical and horizontal lengths, concentric with and overlaying a circle. Called an officious little Jew by the Hampshire Telegraph in 1849 during a period of latent antisemitism, Alderman Emanual Emanuel was a leading force in reforming the town of Portsmouth. Although he refused to take the mandatory Christian oath of office, his focus nonetheless was a fearless spokesman for the advancement of the community. He was a leading force in many important projects i.e. securing water and gas supplies, promoting the railway to London, securing land for Victoria Park (now known as the People’s Park), creating piers and construction of the Esplanade. He became the first Jewish Mayor of Portsmouth in 1849. He died in 1888 and was celebrated with a huge public funeral. His children donated a memorial drinking fountain to the Portsmouth Corporation five years later. It was erected at South Parade where it remained from 1893 to 1934. When it became an obstacle to motor traffic, the structure was relocated to the western end of the Canoe Lake. The Fountain was restored in 1962, 1991 and 2005, and was recorded as a Grade: II listed building on March 18th, 1999. The Fountain is design #126 manufactured by the Coalbrookdale Company in Shropshire. The structure is seated on a square plinth with canted corners. A granite base supports the rounded polished granite pedestal bearing the 5ft 4ins high bronze figure of Temperentia by John Bell. The pedestal offers two taps for drinking which originally contained cups suspended on chains. The bronze statue with wings close to the body has her head lowered as she watches a dove seated on her right hand drink from a water-lily in her left hand. An inscription on the back of the base reads: In Memory Of Emanuel Emanuel, Alderman, J.P. / Who Was Mayor Of Portsmouth 1866-67 / This Fountain Was Given To The People Of Portsmouth / By His Son And Daughter / Barrow Emanuel And Lady Magnus / Aldn. R. Barnes, Mayor 1893. A cast iron canopy over the drinking fountain is supported by four columns; the base of each is gilded with the letters CBD (Coalbrookdale). The columns are sculpted in the form of a vine; internal and external capitals are gilded water lilies with acorn finials (originally these finials were four glazed lanterns). The vines connect in an arch on each of the four sides, and above each arch are intersecting vines and water-lilies. On Thursday October 28, 1909, a memorial fountain commemorating Archibald Hood J.P., a Scotsman who founded the Glamorgan Collieries, was unveiled in Pandy Square, Tonypandy. The fountain was erected using a surplus of the fund subscribed by the workmen and others towards a statue of Hood which had been placed in the grounds of the Workmen’s Institute at Llwynypia. Mr. Hood was greatly honoured, respected and loved throughout the whole of the South Wales coalfield. The 13 feet high cast iron fountain, designed by Mr. R. S. Griffiths, a local architect, was manufactured by the Coalbrookdale Company. It was seated on a pedestal of Aberdeen granite and had three demi-lune basins into which lion mascarons spouted water. A drinking cup suspended on a chain was provided at each tap. The structure offered two demi-lune troughs at ground level for dogs and a large trough for horses and cattle. The central pedestal contained an inscription; This Fountain Is Erected In Conjunction With The Statue At The Workmen’s Institute, By The Workmen Of Llwynypia Colliery And Others As A Memorial To The Late Archibald Hood. Esq., J.P., Founder Of The Llwynypia Collieries. There was also an inscription in Welsh Y Cyfiawn A Fydd Ofalus Am Fywyd Ei Anifail (Diar. xii. 10. ), from Proverbs XII.10: ‘What Feeling Has A Righteous Man For His Beast’. This famous Tonypandy statue was damaged and her arms broken when a car hit the fountain in 1965. The statue was repaired and erected outside the firm of W. Ribbons Limited remaining there until the factory closed. The ‘Lady With the Lamp’ was then relocated behind the War Memorial in Dunraven Street. The fate of the fountain is unknown. In general, the location of many of these fountains became a hindrance to motor traffic, and public awareness of sanitation meant that many of these structures were demolished. The statue continued to deteriorate until it was removed in 1993 with the intention of repair. However, it remained in storage until 2010. With money from the Civic Trust Wales, a project to restore and reinstate the statue was led by the Rhondda Civic Society. Nigel Snell of Acorn Restorations refurbished the statue, recreating missing parts by referencing photos of the original drinking fountain when it was officially unveiled in 1909. The statue is now located not far from the site of its original location in a specially designed community garden in De Winton Street, outside the old Town Hall. It stands on a stone pedestal with the original legend inscribed beneath. Many of the photos were found on the Facebook page, Tonypandy Past and Present. The crossroads on the hill where the high road from London to Cambridge crossed with the one from Benfield End to Stansted Street once contained a traveller’s chapel. After many years it was replaced with a public house and a smithy. These buildings were later demolished leaving a clear area for the erection of a drinking fountain which was funded by subscriptions. The fountain which still stands at the junction of Chapel Hill and Cambridge Road was erected on 12 May 1871, and the water officially turned on by Henry Gilbey, who with his brother Walter, were the major benefactors. A plaque is inscribed; This Fountain Was Originally Presented By The Gilbey Family In 1871. It was registered as a Grade II historic building on 9 September 1976. The drinking fountain, number 8 from Walter Macfarlane & Co.’s catalogue, was manufactured at the Saracen Foundry at Possilpark in Glasgow. The structure is 9 feet 6 inches high and consists of four columns, from the capitals of which consoles with griffin terminals unite with arches formed of decorated mouldings. The structure was seated on a three tiered plinth of Portland Stone with the top step encased with Maw & Co.’s encaustic tiles. Rope moulded cartouches within each lunette host the crest of Mountfitchet. The shield facing Turnpike Road displays an inscription; Stanstead Essex 1871. On two of the sides is the useful monition, Keep The Pavement Dry. 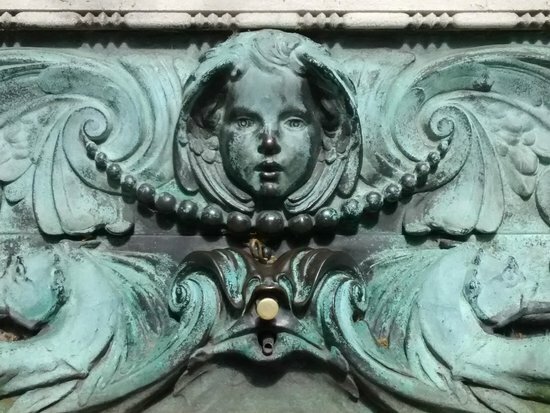 Civic virtues such as temperance were often extolled in inscriptions on drinking fountains. The structure is surmounted by an open filigree dome, the finial is a crown with a pattée cross which was originally surmounted by a gas lamp with 3 burners. Under the canopy stands the font (design number 7) 5 foot 8 inches high. The terminal was originally a gilded crane. The basin (2 feet 6 inches in diameter) which has a scalloped edge and decorative relief is supported by a single decorative pedestal with four pilasters and four descending salamanders, a symbol of courage and bravery. A central urn with four consoles offered four drinking cups suspended by chains. The fountain was operated with bib valves which released water when pressed. The water supply was provided by Messrs. E. Hicks & Son Steam Mill. Encaustic tiles, ceramic tiles in which the pattern or figure on the surface is not a product of the glaze but of different colors of clay. The original Paul’s Cross was a preaching cross and open-air pulpit in the grounds of Old St Paul’s Cathedral, in the City of London. The current cross was designed by Sir Reginald Blomfield with reconstruction completed in 1910. It is situated to the west of St. Paul’s Cathedral. On The Plot Of This Ground / Stood Of Old ‘Paul’s Cross’ Whereat Amid Such / Scenes Of Good And Evil As Make Up Human Affairs / The Conscience Of Church And Nation Through / Five Centuries Found Public Utterance / The First Record Of It Is In 1191 Ad It Was Rebuilt / By Bishop Kemp In 1449 And Was Finally Removed / By Order Of The Long Parliament In 1643 / This Cross Was Re-Erected In Its Present Form / Under The Will Of H C Richards / To Recall And Renew / The Ancient Memories. The west side of the balustrade offers a brass drinking fountain set into stone. A winged effigy watches over a large demi-lune basin flanked by sea horses. Water is supplied with a push button device. Tupelo may be most recognized around the world as the birthplace of Elvis Presley; however, on the lawn of the Lee County Courthouse at Spring & Broadway is a drinking fountain erected by the Tupelo Women’s Christian Temperance Union in commemoration of State wide prohibition. In 1908 there was a lawn, a sidewalk and a narrow boulevard in front of the courthouse. The fountain surmounted by a stone angel was originally located beyond the sidewalk near the edge of the road. It was situated there to allow beasts of burden to drink from a large trough on the side of the fountain. The design also supplied a small trough at ground level for dogs and smaller animals. The drinking fountain was cast by J. L. Mott Iron Works of Trenton, New Jersey, USA. It is seated on a square base with pilasters on each corner and four panels containing bas-relief of an orb with flourish. The capital supports a single pedestal with four sides. The front panel contains a demi-lune basin into which water poured from a lion mascaron. A tin cup was originally suspended on a chain to allow humans the opportunity to drink. Above is a dedication plaque which reads: Tupelo / Woman’s Christian / Temperance Union / In Commemoration / Of / State wide Prohibition / January First / 1908. On two sides is the mascaron of a woman symbolic of the W.C.T.U. which was a religious organization. The angel terminal is displayed with one hand on her heart and the other outstretched in an offer of assistance and comfort. The structure is now enclosed with a protective fence. Andrew Handyside’s Britannia Iron Works manufactured cast iron drinking fountains for the Midland Railway Company in the 1800s. A fountain originally located at Matlock Bath Railway Station is on display at the National Tramway Museum in Crich, Derbyshire. It was erected in 1873 and can be viewed below the Bowes-Lyon bridge. The attached image of the railway station at Matlock Bath shows a drinking fountain located behind the Station Master. It is situated to the right of a public weighing machine below the sign for Mason’s Extract. A second Handyside drinking fountain encased in an ashlar stone wall is situated in Matlock Bath, Derbyshire. A history of the fountain is engraved on a wall to the left of the structure. This Fountain Was Erected In 1881 Below The Now / Demolished Royal Hotel, Which Occupied The Area / Now Forming The Temple Road Car Park. / The Fountain Was Restored In 1917 To Commemorate / The First Meeting Of Scout Leaders In This Area, / Held At The Royal Hotel, Attended By Lord Baden- /Powell. It Was Again Restored In 1935 For King / George V’s Silver Jubilee. Following Reclamation Of The Surrounding Area, / It Was Moved To Its Current Position In 1986, The / Year Of Queen Elizabeth II’s 60th Birthday. All / Works Were Undertaken By The Derbyshire Dales / District Community Programme. When it was restored in 1935 a plaque was engraved to commemorate King George VI’s jubilee year and the first Conference of Scout Commissioners in the area in 1917; 1st Matlock Bath / BP Scouts / Jubilee 1935. The design of the drinking fountain is the same at their standard Midland Railway Station design with the addition of an animal drinking trough at the base. The standard design had an arch shaped structure with flat panel inset surmounted by a narrow plaque indicating the date of erection. A decorative demi-lune basin with flora relief was supported by an embellished console. Water was supplied from a lion mascaron with the push of a button.